I'm a bit of a southern transplant. Born and raised in the north, we made our way to the south my sophomore year of high school. The place took some getting used to, but I was already in love with the food. My father was from Alabama and loved some grits, fried fish and fried green tomatoes. We were practically the only family I knew of that ate grits or even knew what they were. I'm still here, married now to a sweet man from Georgia and with a daughter whose southern accent is thick as molasses. I was so excited to review a book to help me hone my southern cooking skills, especially one on our favorite meats - "The Southern Foodie's Guide to the Pig: A Culinary Tour of the South's Best Restaurants & the Recipes That Made Them Famous" By Chris Chamberlain. Chris Chamberlain is a food and drink writer based in Nashville, Tennessee. He compiled this massive guide dedicated to the art of cooking a pig the southern way. Part 1 consists of information on how to cook the animal as a whole, as well as the best ways to cook each part. He gets tips from the experts and shares secrets on how to get the best flavor. He even goes into the different sauces an rubs used across the south and how to make them at home. Part 2 consists of profiles of favorite southern restaurants. He gives you background on their history, specialties and insider tips to make your experience there they best. Part 3 are the recipes. Some are even from the restaurants profiled in part 2. For a complete southern experience, he has included drinks, breakfast, bread, soups and salads, side dishes, entrees, and deserts. 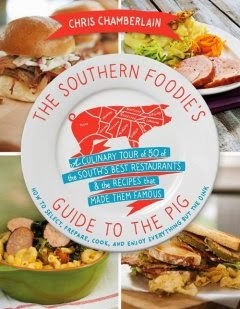 If you're a southern foodie, know a southern foodie or just enjoy your pork, then this is THE book to get. Easy to follow and not overwhelming considering it's size, this book is a keeper. I will be re-reading and referencing this guide often.